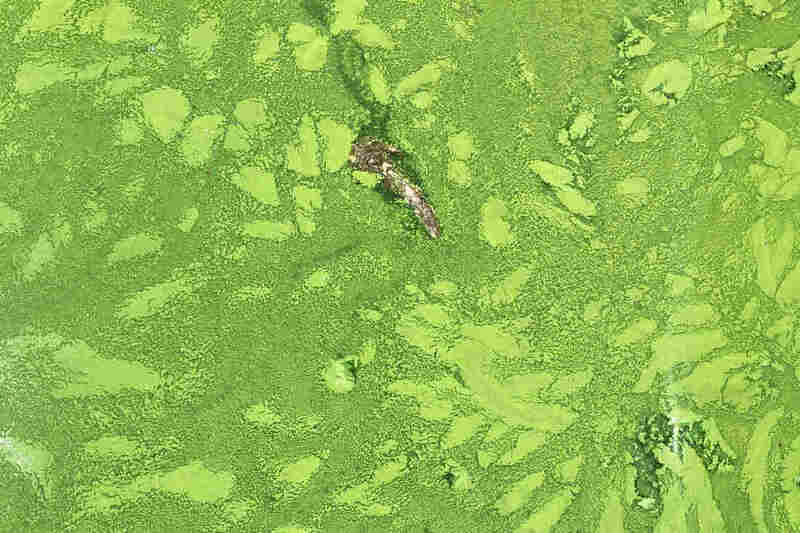 Poisonous Algae Blooms Threaten People, Ecosystems Across U.S. Serious algae outbreaks have hit more than 20 states this summer. Algae blooms aren't unusual. But the frequency, size and toxicity now are worse than ever, and changes in climate are partly to blame. 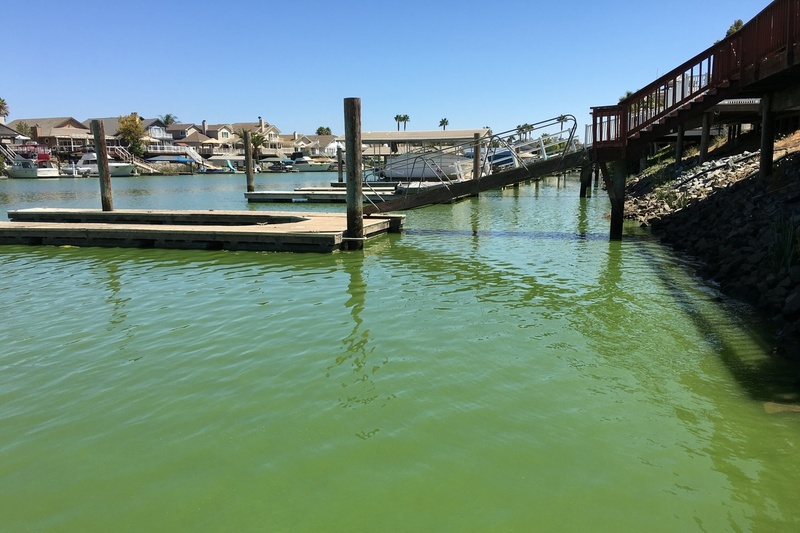 Officials found the toxin microcystin in the blue-green algae present at Discovery Bay, Calif. For people exposed to the toxin, symptoms include dizziness, rashes, fever, vomiting and in more unusual cases, numbness. And water managers are rattled. "Everyone's on edge with the cyanobacteria," says Bev Anderson, a scientist with the California Water Resources Control Board. Emails reporting outbreaks of cyanobacteria — or blue-green algae — fill Anderson's inbox every morning. But what's most alarming are the toxin levels, which Anderson says are "crazy." Twenty micrograms per liter would be worrisome. Current readings are as high as 150,000 micrograms per liter. As for the threat the algae outbreaks pose, water districts carefully screen for toxins in drinking water. It's boaters and swimmers who are most at risk. Discovery Bay, a community about 60 miles east of San Francisco, is normally buzzing with boats and personal watercraft. But this year, the waterfront has been eerily still for weeks. On a recent day, Dave Holmes watches with disgust as his white speedboat and blue kayak bob in mucky green water. "We've been here since 2002," Holmes says. "It is by far the worst we've ever seen." Down the street, another Discovery Bay resident regrets diving into the water in mid-July. Wade Hensley ended up in the hospital because his body went numb from the waist down. It's still numb. "And, it was about three days of swimming. Not constant, but in and out. And they can't pinpoint exactly what it is," Hensley says. But, county health officials did find microcystin — one of several toxins produced by algae — in Discovery Bay. More typical symptoms are dizziness, rashes, fever and vomiting. The docks behind homes at Discovery Bay, Calif., are quieter than usual because of fears of blue green algae toxins. Algae expert Bev Anderson blames a changing climate for the blooms, at least in part. "We're getting higher temperatures than we've seen ever in the past," she says. "California had an unprecedented drought for the last five years which [has left] the water levels very low in a lot of areas." And shallow water means warmer water. Add to this cocktail, runoff from farms, golf courses and lawns — algae love fertilizers. Worst of all, Anderson says, scientists are just starting to understand a problem they expect to escalate. "Some areas have been monitoring and seeing blooms for decades, but they've never had toxins," she says. Researchers are finding poisonous blooms in surprising places like mountain lakes and streams. So scientists are scrambling for solutions. The chemicals that kill algae can help temporarily, but they can also backfire by promoting other toxins. When it comes to swimming, Anderson's advice is simple. "If in doubt, stay out!" she warns. "Don't go in, don't let your dogs in." There's nothing to do now but wait for the green muck to disappear — and hope a cold winter kills it off.